The Whitney Museum closed its Madison Avenue location yesterday (10/19/14) when its blockbuster Jeff Koons retrospective ended. More than 250,000 people saw the exhibition since it opened in June. The museum ended things with a bang, staying open 36 continuous hours during the final weekend. Whitney Director Adam Weinberg said, “This will not only give more people an opportunity to see the Koons retrospective, it’s also a chance for some to say goodbye to the Breuer building as it was.” The closing weekend drew huge crowds. 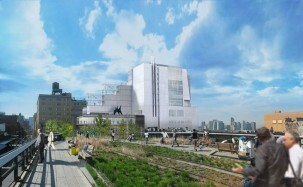 The new Whitney Museum building in lower Manhattan is nearing completion and is scheduled to open in spring, 2015. Check out the video preview. Designed by architect Renzo Piano and situated between the High Line and the Hudson River, the new 200,000 square foot space will vastly increase the Whitney’s exhibition and programming space. 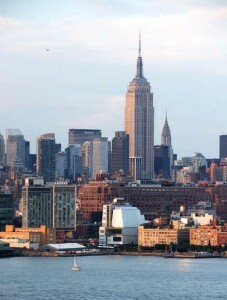 The new building is located at Washington and Gansevoort Streets in the Meatpacking District, a 20-square block neighborhood bordered to the north and east by Chelsea and to the south by the West Village. The building project began in 2007. When the new building opens, the Metropolitan Museum of Art plans to present exhibitions and educational programming at the former Whitney’s uptown building for a period of eight years, with the possibility of extending the agreement for a longer term. The Met’s lease begins in the spring of 2016 and runs through 2023.